It's a tropical flavor, perfect for summer, and despite what all the grocery stores say it's STILL summer, so there's no better time to review it. (Well maybe when I first bought it, but that's just insanity.) 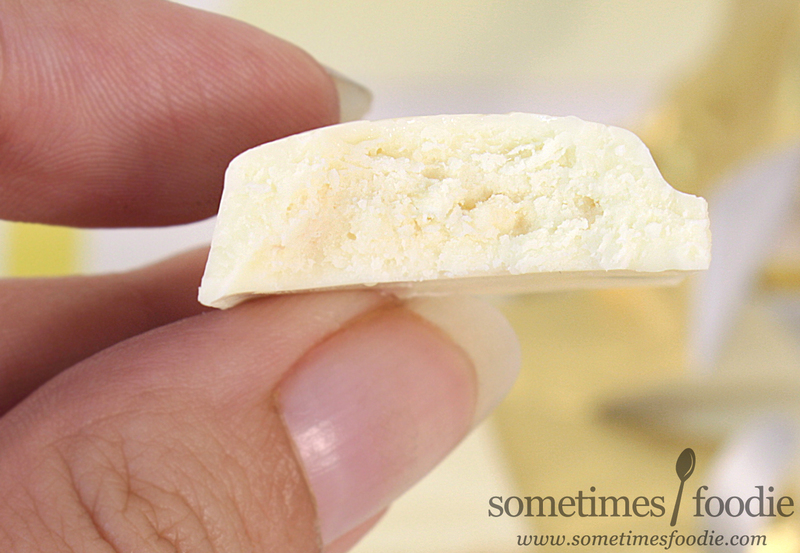 Join me in me summer-ding-denial as I binge on tropical white chocolate. "Every bit makes crum, crum, crum..." Um..., ew. "Mmmmhh..crunch it!" Doesn't sound any better. These phrases are too bizarre. What do they have to do with anything? (Although I have no problems with "Let's get ready to crumble!") They aren't love-y, or seductive, or related to the flavor. It's like we're getting hit on by a baby-talking drunk who's had one too many piña coladas. No thanks. 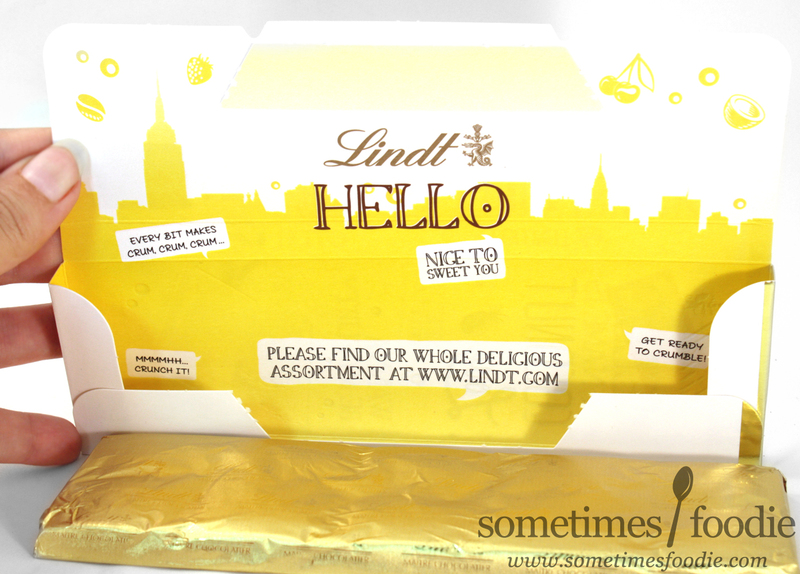 I love the pops of color and the effort Lindt's putting in here, but this packaging seems like a mis-fire. No wonder it ended up on clearance. I peeled back the gold colored foil and the bar inside was shiny and off white. It's your typical break-apart bar, but the segments are domed due to the fillings inside. As soon as it hit my photo lights it started to melt, so I had to work fast. The room was starting to smell like a tropical sun-block paradise. Lots of sweet cream with coconut and pineapple notes. I broke off a segment and took a bite, and it's good! Really good! Especially for Lindt (I'm normally not a fan of their flavors, but I always love their packaging.) 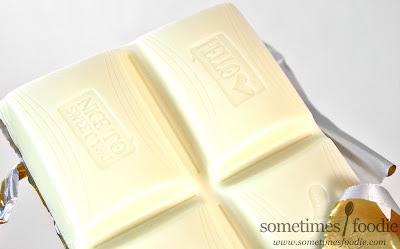 The white chocolate quality is pretty good! It melts away on your tongue and the filling consists of dried coconut flakes and pineapple bits. The mix-ins add some slightly tangy fruity flavor with a delightful crunch, and the creamy base keeps it all together. I love it! 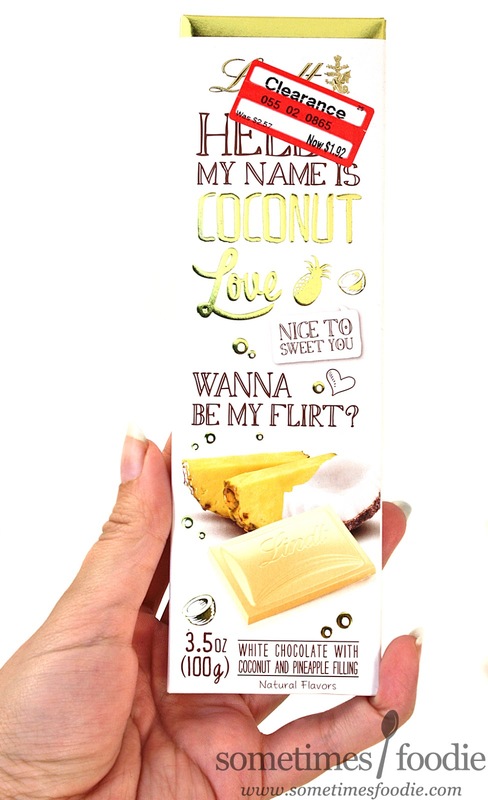 No one flavor over powers the others and you get a pretty enjoyable piña colada candy bar. The dried fruit bits do get stuck in your teeth occasionally, as coconut usually does, and the candy can't handle heat very well, but it tastes great. The bizarre package phrasing may have scared away customers, but it's a great summery candy bar with decent ingredients and refreshing fruit flavor. I personally wouldn't pay full price for it, but it was a great clearance find. If you like this, you'd probably love Ritter Sport's summer line (Sommer-Sorte). My absolute favorite is the white chocolate with peach and passion fruit yogurt filling. Haven't had that in years, but this review reminded me of how much I enjoyed this combination.